I make these Voodoo dolls for clients who want to start working with Voodoo Magic and to attract the specific blessings of a particular Loa or Orisha. 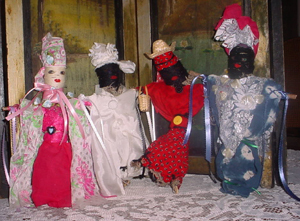 Each doll is hand-made by me personally, starting with natural Louisiana products and taking into account the attributes and specific of each God and Goddess of the Voodoo pantheon. Each Voodoo doll is unique, yet true to its purpose. It can be used to obtain blessings or it can be the center-piece and focus of the altar you wish to construct to your Loa or Orisha. As you work with each doll, it will become a bridge in your relationship to the Loa or Orisha. I always use natural textiles in a wide variety of colors, style, and texture. When it is perfect, it is sent to the client with complete instructions on its care and potential magic. A unique intercessor who will communicate back and forth between the worlds! It is always best to obtain a reading to determine which Lwa or Orisha will work best with you! The youngest of the Spirits, He is Spirit of Fate and Destiny. Helps remove obstacles and open the roads. For good luck, games of chance and to achieve one's goals. Ancient Spirit of Fate and destiny. For luck, to open one's roads, overcome obstacles and win at games of chance. To achieve one's goals. For abundance, healing, protection & blessings for GLBT persons. In 2004 Rev. Louis Martinie and Rev. Severina traveled to Paris for a week. Their travel log and journal became an essay on Voodoo, the Ancestors, healing the past and the Myth of Sisyphus. Lavishly illustrated with graphics and photographs of Paris and Louisiana. Voodoo at Cafe Puce is now offered as an e-book download. A unique document by two of the foremost Voodoo practitioners in New Orleans today. A must-read for anyone interested in Voodoo and New Orleans culture at the very time when it is endangered. Click here for more info and to order.